Samuel Cockayne (1768-1856) arrived with his brother, Carter, in Western Virginia from Maryland circa 1795. This was the same year that the Greenfield Treaty was signed, pushing the Indians further west and solidifying peace in the Upper Ohio River Valley. Samuel purchased a tract of land north of Moundsville that totaled one mile square from a Revolutionary War soldier. In 1798, he built a farmhouse along Wheeling Pike from virgin walnut logs and engaged in farming. He also operated an “ordinary,” or hotel out of the farmhouse called the “Andrew Jackson Inn.” Samuel would eventually acquire 539 acres of farmland, comprising all of present-day southern Glen Dale. The farm bordered the Ohio River on the west, crossed the valley to Little Grave Creek and crested the hillside on the east. The Cockayne Family continued to grow and disperse with Samuel’s sons, Samuel and Hiram, moving to Iowa and his son William settling in Wheeling, WV. Upon their father’s death, two of Samuel’s other sons, Bennett and Vincent, would divide the 539-acre Cockayne Farm. Vincent took the original homestead, known as Valley Farm, and the southern land. Bennett (1805-1875) had already built the present Cockayne Farmhouse and thus acquired 303 acres of the northern land. Bennett served as postmaster in Moundsville and kept a general store in Elizabethtown. His first son, Alexander, graduated from law school in Virginia and operated a law office in Moundsville. He also reportedly taught the first school in Glen Dale from the Bennett Cockayne farmhouse. Left to right: Alexander, Bennett, and Samuel A.J. But it was Bennett’s son, Samuel A. J. (1841-1904), who would next inherit the farm and bring the farm to international prominence for the merino wool it produced. Perhaps this was fitting, as Samuel A.J. had left his mark on the farmhouse as a child...his footprint and initials are imprinted in the stone hearth of the farmhouse. Samuel A. J. married Hannah Jane Alexander in 1863. According to a Cockayne family genealogy provided by John Cockayne and printed in the History of Marshall County, W.Va. published by the Marshall County Historical Society in 1984, Hannah gave the name “Glendale Farm” to the homestead, and this is the derivation of the Town of Glen Dale, which incorporated in 1924. While he operated the farm, Samuel A. J. raised purebred, fine-wooled American Merino sheep and took first prize at the International Exhibition held in Philadelphia in 1876 for “one fleece of good Merino wool.” Other awards would follow and the Cockayne stock would be sought after by British and Australian, as well as American, breeders. Samuel A. J. and Hannah had five daughters, Ella, Sara, Gertrude, Dora, and Irena, and one son, Samuel A. The daughters were all extremely artistic and excelled in music, drama, and various forms of artwork. Much of the artwork produced by the sisters can still be viewed inside the house. Of the next generation, Samuel A. 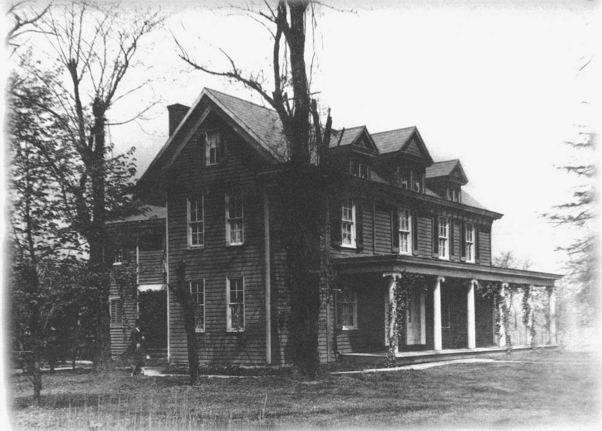 (1874-1953) inherited the farmhouse and most of the farm upon his mother’s death in 1917. Samuel A. was a member of the Washington District Board of Education in the early 1930's and Postmaster of Glen Dale from 1935 to 1950. He was also designated a “county wool dealer” in 1918. In addition to raising their own wool, the Cockaynes gathered wool from local rural farmers and distributed it to eastern markets. Samuel A. married Beulah Smith in 1919 at 45 years of age and together they had two sons, Samuel A.J. and John. Upon Samuel A. 's death, the farm passed to Samuel A. J. Cockayne. Samuel A. J. was born in 1921. His only ambition was to farm the land of his ancestors; and he quit high school in his sophomore year to take over the running of the farm. World War II intervened, however, and Sam was drafted. His letters from basic training are still in the collection, and they speak of his concern about the ability of his aging father and younger brother to manage the farm work and bring in the crops in his absence. Sam served his country honorably in the 75th Signal Corps (JASCO) stationed in the South Pacific. But on his return to civilian life, he slowly adopted a reclusive lifestyle, refusing to modernize the farmhouse he inherited and living with only the most basic of necessities. Upon Sam's passing in 2001, the house was bequeathed to the city of Glen Dale with its entire contents. The city reached out to the Marshall County Historical Society to manage the project of saving the house and developing it into a community and cultural center.